Those facts didn’t tell me that she would make funny faces and dance like crazy to Fresh Beat Band. That she loves to sing. And swim. And go to gymnastics. And unload all of my kitchen cabinets. What those facts didn’t tell me in all that they “meant” is what she would mean — to me, to our family, to our friends. Will things ever be normal again? I thought. And then one day — soon — they were. Except they weren’t like before. They were better. Suddenly, the overwhelming facts and fears faded. Because instead of knowing a diagnosis, I grew to know her. Because of her life, I have the unique perspective of seeing the best in the human spirit — and not just in her spirit (though she’s quite spirited!) but in everyone else. In a world where it’s easy to view strangers through skeptic eyes, I have seen an outpouring of love and compassion surrounding her. I have connected to those I wouldn’t have otherwise. I have had strangers stop me on the street — just to tell me how beautiful she is. The world can seem like a scary place for any child, especially those with a disability. But I have met so many who just want to love her. When Kate was just a few months old, I went to Target to pick up some groceries. In line that day, I met the mom of a 19-year-old man with Down syndrome. And when I shared that my daughter also had Down syndrome, her eyes softened and she held my gaze with a warm smile. Wow. What a lucky girl to have you. And it appears that she has made you feel like the lucky one! Thank you… This was beautiful. Wonderful words of encouragement – thanks for sharing your personal story. Will share with my patients! Great letter, you are such a wonderful mother. I too had a birth diagnosis; it’s like you wrote my story too. The emotions, what doctors told us, that craving for normalcy and more importantly where we are today. I wish they had told me I hit the jackpot. It’s a slightly different journey then we expected, but it’s a far more beautiful one. If only doctors and moms who receive prenatal diagnosises could see what we see. Great piece! My sentiments exactly! We also found out our daughter has DS after she was born. The information was not given to us in a loving, kind, compassionate way. I was devastated! Now, of course, I know better, and yes, they really should explain that we did hit the jackpot! These are very special gifts from God, and we’re lucky to be their mommies! This is so beautiful! This will help a lot of moms. You wrote very beautifully about your journey. I just finished working for 8 years with special ed pre-schoolers. The children’s with downs symdrom are all unique in their own way, and so delightful. I will miss them. I hope many receiving the same diagnosis will read this. I love how you pointed out that you don’t get to know a diagnosis, but a child. So true! We don’t know each other, but I did meet you once a long time when I was with your mom. I just had to write to tell you that you are a beautiful writer and an inspiration to all mothers. If only we could be half as insightful as you. I am sure you are one in a million along with your mom…..I have always thought so highly of her. You have a beautiful spirit. May God Bless You and your wonderful family. im so teary eyed. My daughter had a rough begining. Im prayfully lucky she is “normal” except some minor health issues. your daughter is so lucky to have such an amazing loving beautiful souled mother. your words were so touching. God creates everyone in his image…whenever i see a child or person with ds i just am in awe at how beautifuly made they are. One mother took offence to me aproaching her about how beautiful her one year old was. She almost got this face of relief when i told her, my daughter, the same age, threw fits just as bad about getting her diaper changed. 🙂 God bless u and your family. Hello! Found your blog through Mommies of Miracles on Facebook. Beautiful post! I’m a mommy of a miracle, too, although with a different diagnosis than Down syndrome. My daughter Grace was diagnosed prenatally at 20 weeks, and she is now 2 years old! I think you could title your post “Dear mom with a prenatal __(fill in the blank)__ diagnosis”. 🙂 I connected with so many emotions from this post! We are truly on a beautiful journey! My daughter doesn’t have Down’s but had a similar birth story with a different diagnosis at birth. It was horrendously difficult in the early days and I will always remember the shock at how intense my love was for this little bitty girl. I loved your blog. It reminded me of our neurologist who put it into perspective by saying “she is your daughter and it doesn’t matter what the labels are. She will have many health care professionals care for her but only one mom. Go home, be her mom, and love her.” Because of her we have seen a softer side of the world, and we have learned how much our community loves us. What a gift to have a child. I just love this!!! I didn’t find out about my daughters Down Syndrome until she was 2 weeks old but its all so true! Luckly I got to “KNOW” her before the diagnosis because it took me 6hrs to get over it! Wow, that was simply beautiful. Thank you so much. It’s like you wrote exactly what’s on my heart regarding my precious daughter who has a rare chromosomal abnormality and just turned 2 a couple of weeks ago. It’s certainly a challenge, especially now as she’s not walking yet, but I’m so grateful for the progress she has made in the past year and even more so, for her incredibly beautiful, feisty and delightful personality that is blooming. I pray that your letter reaches many women who need it. Your words are beautiful, and true. We had a prenatal diagnosis, I was devastated, and angry, and bitter. Over time, as I got to know this little girl child, my feelings shifted to bittersweet, as she / we struggled through the myriad of weekly and bi-weekly feeding therapies, physical therapies, occupation therapies, speech therapies…. Wasn’t there any time to just BE? And then, slowly, that time came, and I began falling more in love and forgetting the bitterness… Today she is a delightful 11 year old who considers herself a Rock Star. She is all light and life and purity…the glue in our family. Her younger brother uses his own money tobuy her treats for when she meets a goal, finishes a race. She has half a dozen different pitched silly voices, loves to sing, loves to swim, loves to join in whatever the game that is being played. I can not imagine life with out her. I also had a birth diagnosis. My little guy will be 3 in 2 weeks and he continues to amaze us every day. Like you I have met some wonderful people that I would never have met, if not for being blessed with our Angel. Thank you for writing this wonderful letter brought tears to my eyes. We got a Downs Syndrome diagnosis alony with other maladies….we terminated and have never looked back. Early blood tests at 6 weeks saved our marriage and hopes for an early retirement. Selfish man, now you will never know the joy that children bring. Regardless of my sons diagnosis, he is an amazing little boy. We focus on what he can do, instead of what he cannot. Although the way he told us this sounds incredibly callous, and many of us would have made a different decision, please don’t be so quick to judge. We don’t know his circumstances, or the nature of the other maladies he mentioned. Your loss! You are clearly a very selfish person to think that your short sighted comment would be welcome here. My 5 year old son has down syndrome and yes we travel the world and go on adventures and sharing it all with him makes it all the better. Your defensiveness is showing, too. How sad you can only love conditionally. I can understand why you never look back, one day when you do you will catch a glimpse of what you threw away. A sweet baby who would have been the love of your life. My husband and I have three children. Our first was diagnosed was Trisomy 18 at the 20 week ultrasound and passed away sometime before my next appointment two weeks later. Just over a year after that my second son was diagnosed at birth with DS. Eighteen months later my daughter was born, she is ‘normal’. We never had prenatel testing and never would have considered killing our children, because luckily we realize something you don’t. Your children do not owe you anything, you owe them all the love you can give. The fact that an early retirement and the fact that your marriage is so superficial that it can’t stand the ups and downs of life makes me think that you never should have tried or should try in the future to have children at all. Why are you so defensive? Bob simply decided that the financial, emotional, and psychological costs of a lifelong commitment to a disabled child were more than he and his wife were capable of bearing. His choice is really none of your business, and your self-righteousness is just as appalling as his perceived insensitivity. That is just the point. Who of us out here decided beforehand that we were capable of all that? We have just taken it one day at a time, done what we can, tried our best, made mistakes, learned a lot cried, laughed, wrung out hands. And in return we got the wonderful experience of having a child (for us now, a young adult) with DS. Many of us believe that they are earth’s angels. There are never any guarantees in life. In the blink of an eye any “perfect, normal child” can become a financial, emotional and psychological lifelong commitment. What is your choice then? Euthanasia? Chris, you just did the same thing that you accused another of. I have to disagree.. by posting it on here it is no longer his business, he made it everyone elses. And I have to agree, terminating a life (aside from very few exceptions) is reprehensible, especially when there are so many people out there who would have been more than willing to love that child and give it a home. Financial, emotional and psychological costs of a lifelong commitment that accompany a child with disabilities would never outweigh the benefits and blessings. My opinion is much the same as everyone elses here, they ended a life because it might ruin their “early retirement” was a VERY selfish reason indeed. I feel sad for them because they will never know the meaning of unconditional love… and apparently you are not able to grasp the concept either. And if they think that their marriage would have been in jeopardy because of this child, then they should have their marriage evaluated. It has only strengthened mine. Having a child with disabilities is a blessing, not a burden. I should know, I have two. I know that you will probably have a response to this for whatever reason you might have for justification of this subject… but I ask you… Do you have a child with Down Syndrome, and if you do, would you take that life because you don’t want the responsibility. Defending someone who boasts that they terminated a life on a public forum where everyone is celebrating these precious lives was in very poor taste and he just wanted to get exactly what he got… attention. Thank you Chris, for your comments. Life is difficult , whatever choice one makes. I did a funeral for a child who’s mother put her through so much to keep her alive that her short existence was more about pain and suffering. Other maladies could speak volumes. My granddaughter with Down’s is a joy. But we have been fortunate because she has no other issues except hypothyroidism. Is is easy to judge another’s decision when it is not the same as ours. Why are you so judgmental of everyone else and so defensive of Bob? Did you also do what he and his wife did and are trying to cover up hurt, or what? It sure sounds as though you are trying defend abortion here, which if you have read anything at all of Focus on the Family’s point of view, you will know that yours and Bob’s comments are totally out of line according to a Biblical worldview! I feel sorry for people like the both of you who have no interest in anyone else’s opinions but your own selfish views about life. What joy you are truly missing out on, but feeling this way!!! Wow. Selfish and cold. You killed your child because it didn’t fit in with the image you had for your family. I am SO glad you didn’t get to have the PRIVILEGE of raising that beautiful soul. You didn’t deserve it. But my heart aches for the sweet, innocent life you cruelly snuffed out. There were thousands of families just like my own, who would have welcomed that child into their families with open arms. Our three adopted girls with Down’s are the joys of our life. Retirement? Not a chance. And the sacrifice is SO worth it! You will never know. What privelidge? extreme financial and emotional hardship for his family and a difficult life for the child? That doesn’t sound too rewarding to me. Some people here are seriously disconnected from reality. Tipt, It is obvious that you have never been lucky enough to enjoy the love of a child with DS. Yes, they really are that special. There was another article about divorce among couples who have a child with special needs. With other disabilities, including medical with no mental retardation, the divorce rate is higher than in the general population. But, the divorce rate in couples who have a child with DS is lower than that of the general population. These children are so special and so full of love for others and life and themselves that they actually keep marriages intact. How about that? Earth’s angels. Reality is living with our wonderful, special children, and seeing how they have greatly enriched our family life! Financial hardship? ANY child costs money, but is that really what our “bottom line” ought to be? Money? That is such a narrow, shallow criteria for saying whether or not life is worth living! Difficult life for the child? Do you even KNOW a person with Down Syndrome? You couldn’t possibly or you wouldn’t make such a statement. It is YOU, Tipt, who are disconnected from reality. I wouldn’t have missed this life with my kids for anything on earth! Well you are an anomaly. . .I know of few people who have adopted and fewer still special needs kids. Actually, I know quite a few people who have adopted special needs children, including my parents. I have 2 younger sisters with Down Syndrome and a third with a partial trisomy 18. My family had to be on a waiting list for one of my sisters who had Down Syndrome because there have been large amounts of families who have expressed a desire to adopt. I feel sad for you. You seem out of touch. MANY families SPECIFICALLY adopt children with special needs due to people like you and your wife who don’t find out prenatal about the special needs, not decide not to keep the child. EVERY child deserves love and you took that opportunity away from your child. You made your situation everyone’s business when you posted here. I have to think you have some regret or you wouldn’t feel the need to post here and justify your actions. You are looking back or else you never would have read this blog in the first place; much less commented on it the way you did. I’m going to call you out on being the worst kind of troll. The new Materni-T tests are not performed until 10 weeks. Perhaps you simply hate babies and are best not to have any…ever. If you want to retire early that only seals that comment. Why you would seek to post something so thoughtless and baseless is beyond me. If you chose to abort a baby of unknown health that early, that’s your choice…but don’t pretend it’s because they had Down syndrome or any other disorder. Bob, I am sorry to say that because of your decision, you will never know how rich you could have been. Children with DS give unconditional love day in and day out. Oh, and I plan to retire early. I am the parent of two awesome adult daughters and the grandmother of a beautiful healthy four-year old grandson. I am in awe of the knowledge and technology we have available today to help us meet our goals and reach our dreams. On the other hand, although we live in times of such progress especially when it comes to family planning, our hearts are not always in sync with the available options clinically as many parents still struggle with their feelings when faced with challenges like infertility or a daunting diagnosis. Life’s challenges don’t begin with the diagnosis of a child that may have disabilities no more than the birth of a ‘normal’ healthy child guarantees that a parent will not face huge hardships if that child becomes involved with drugs during their adolescent years or develops a mental health problem at some time during their childhood. The best characteristic a parent can have is resilience ~ no matter what happens they never lose sight of why they love their child even through the bad times. And for Bob, life’s challenges don’t end with the termination of a baby that could have jeopardized his marriage and hopes for an early retirement. Challenges continue as long as we are breathing. Even when you think you’ve got it made in the shade, what happens if your spouse or a loved one becomes disabled or critically ill? Thank goodness, terminating them is not socially acceptable currently although there are other ways to free yourself from such a burden that some people will understand and nod in agreement. I pray that Bob and those like him never have to face decisions that will challenge their hearts as well as their minds. Oh, by the way, I am 61 years old and have worked all my life to be independent and self-sufficient. I have endured life-threatening illness including being in a coma for three months. Aside from needing oxygen, I still live independently and as normal as life as possible. I do this without being on welfare or being a drain on anyone else’s money; on my own I managed to secure a comfortable retirement ~ early retirement. But I would trade my material comfort in a heartbeat if I had to choose between owning a TV or taking a vacation or weekly visits to a spa if that meant not having my daughters and my grandson in my life. I was told early that my son would have down syndrome as well. I opted to not have any evasive procedures and follow through, as it would not matter. I would love my child regardless. Thank God, I did not listen to doctors and terminate. My son was a beautiful, intelligent and healthy child. Later I received the same diagnosis with my daughter. Again, completely normal. I am so sorry for you. Because whether you believe it was the right thing to do or not, you have to still wonder. But, there is good news. God is a forgiving God. I pray that you have come to know him and have found peace and forgiveness for your decision. Bob, your being here means you ARE looking back. Do you regret ending your child’s life? There is forgiveness and healing in LUMINA. Time to heal. This just isn’t the place for such a comment. Everyone can make their own choice but go post someplace else! Hope you are enjoying your childless retirement Bob. This made me cry tears of joy! This is so beautfiul!!! How blessed are we to be parents of our wonderful children. I love how I can feel exactly what you wrote! God bless you and your precious child!!! We are so blessed! I am the mother of wonderfully funny, interesting, consternation-causing, loving, caring, twenty-four-year-old Miss Emily. I thought I was a good person before she was born. I know I am a better person since she was born. Thanks for sharing yours (and our) story. I could ask for nothing more than to belong to that secret sorority. AND CATHAL HIS PASSPORT TO HEAVEN. I was told that Sarah would not make it past two years old and on a scale of one to ten she would probably be a 2. She was a 7 month baby and in O2 tent for the first few days after she was born. The doctor suggested we just turn off the O2 and let her go. He was dismissed. She will celebrate her 42 birthday in August. You took the words right out of my mouth. Thank you for putting this out there. I am like you, I didnt know until after she was born that my daughter had down syndrome. She was born in Idaho where there are no such things as Doctors who specialize in DS, so my doctor had very few facts and I had even less. He did say one thing that impacted her and I the rest of her life… Treat her normally. And I have as much as I have been able to. But she isnt normal, she is super normal… she is the best thing that ever happened to me and I wouldn’t trade her for the world. You can see her on her own website at http://www.livinmydreams.com. Welcome to the wonderful journey with Down syndrome! Love this! My daughter has a rare genetic defect and I felt the same way when we found out (except she was 6 months old..) but the past 2 years have been wonderful. Some very difficult times thrown in, but she has truly taught me so much. She is smart and funny and has a personality that just draws everyone in. I just found your blog and am so glad! Well said. Brought back many memories that brings tears to my eyes. I am so proud of my daughter who is now 22 and of what she has accomplished. She is a role model for everyone she meets with such a kind heart and innocence. I am the grandmother of a beautiful talented incredible three year old with Downs who also has thick blond hair and the most beautiful face in the world. Thank you for that incredible article which said exactly how we all felt when we found out seven hours after our Emma was born that she had DS. I can’t wait for my daughter and her husband to read your article. We are all enjoying this journey with Emma ……… we are so blessed. Thanks! You have no idea how much I needed to see these words this morning. To Bob you sound both shallow n ridiculous. I feel sorry for your wife. This article was beautiful. I too have a gorgeous daughter with Down Syndrome n wouldnt change a thing about her. I also didnt find out til after she was born and glad of it cause i wouldve worried needlessly. She is the most amazing high spirited independant girl ever! She loves to sing n dance and everyone who meets her loves her! I feel completely blessed n lucky to be her mother! Again, you’re being unnecessarily defensive. Why do you feel sorry for his wife? Sounds to me like she made the decision with him and is content with it. Of course you wouldn’t change a thing about your daughter. You couldn’t change her anyway, even if you wanted to. It’s marvelous that you care for and love her so deeply, but that doesn’t give you the right to disparage Bob’s choices. Chris, when Bob chose to post his comment in response to this heart warming piece, he invited judgment of his comment and decision. Moreover, it’s perfectly acceptable to judge the objective “choice” Bob described, even if it’s not possible to know his conscience and subjectively judge Bob himself. The decision he described–to kill his baby for the sake of “an early retirement”–is objectively selfish and wrong. Hmm…he invited judgement just because of what his opinion is for his own personal life? Well, to that I would say…. “Judge not, that YE be not judged.” Only God can judge what he and his wife decided to do. One thing I have learned since I had my own special needs son 22 years ago is that life is unfortunately not black and white…. it is all shades of gray. And while I would personally not have chosen that route, I cannot judge him and his wife, only God will……. Chris, since you seemed to be heavily interested in all the comments regarding this article, perhaps you would like to share something about yourself regarding this issue instead of jumping on everyone else. The big problem with Bobs comment is the way he put it. I get he made a life decision that was best for him. (Even if I don’t agree). The way his comment comes across is mean. (you have to know people will get defensive, when you post a defensive comment on a beautiful letter that was written). A lot of us have children with down syndrome and love them unconditionally. Until you experience having a child with Down Syndrome it may be hard for someone to understand. I can tell him that my child has made family bonds stronger. As for retirement. You never know what will be thrown at you. It finally downed on me that perhaps Bob was looking for absolution here or some indication of support that he made the right decision. I think Bob has regrets. Otherwise, while he is reading blogs (or anything for that matter) about babies with DS????? I meant to say WHY is he , not while he is. I was thinking the same thing about Bob after reading all the comments. I also have a wonderful special needs adult boy who is 18 now and he has brought a ton of joy in my life and taught me what is important in life. It isn’t all the material things and it isn’t an early retirement, it’s family and having him in it. 🙂 I didn’t know he had a disability when he was born and I’m really glad I didn’t have a choice in the matter. I still don’t understand why you’re so concerned about the replies to Bob’s post. Why are you so determined to defend him??? Are you guilty of the same selfish decision in the past? There are some of us who would have been delighted to adopt a child from parents like Bob and his wife, because it puts a whole different light on this subject when you can’t have children, handicapped or not!!! We would love to adopt and love a sweet little one who isn’t loved in his/her own family! Thank you. I have been blessed to know a few individuals with Downs Syndrome in my life and it does seem like they see the world through special eyes. If they don’t have the ability to learn as fast, they make up for it with the ability to love. They are complex, funny, open-hearted INDIVIDUALS and it breaks my heart to think that women are being encouraged to discard them like an infected appendix. Sure, there are challenges with a Downs child, but every child comes with challenges. Really well-said! I love what you wrote, and identify with it, too. Had my own angel for 27 years. Finished writing her story on her 30th birthday. Thanks for sharing your journey. Elaine, if you want to share with some other members of the same ‘special club’ we have a bereavement group on Facebook for anyone who has lost a loved one with DS, whatever the reason. Contact me if you want to join. What a great story. I have 3 kids all with moderate to severe medical issues. While they do not have Down’s, people tend to give generalizations about what they have not who they are. We can not pretend some of those generalizations do not exist, however, we can’t live by them. Our kids are more then the disorders they have. They are individuals. What a Beautiful Mother you are to I know a Beautiful daughter. God gives us our special children for a reason and I am so thankful for mine. One with a heart disorder and one who is Deaf and I would never trade either one for anything in the world. Now both grown and adults — but what a wonderful journey it has been. You too will have a wonderful journey because of the person that you are. God Bless you and your Family. Phils 4:13 I can do ALL things through Christ who Strengthens me. I too did not know my son , now 11 years old had Down Syndrome until he was born. I was told only horror stories and asked if I wanted to give him up for adoption 🙁 I am so glad the Doctor’s left the room quickly because mama lion came out.lol My son loves to sing also to the fresh beat band , and loves to dance. He loves to play in the rain , swim , roller blade, bowl . Loved by so many people. He has an big sister whom is his hero , he mimics her all the time. His first I love you was to her.? Very nicely written to all new mom’s and dad’s. Life is going to be so much happier for all involved in your little one’s arrival . I did have really missed out. God truly blessed us. Your story and feelings are almost identical to mine. Thank you for sharing. I hope it makes a difference in someone’s decision. I wouldn’t trade my journey for anything. My daughter brings me more joy than I could ever imagine and she continues to amaze me daily! God bless you and your family! Krista – Don’t ever think you’re alone in this journey! There are many of us out there to listen and share advice, tears, hugs whatever! Lauren – you nailed it. I cried reading your post. I cried when our son was born – mostly due to my ignorance. I regret that, but I also feel like I’ve earned the love I have for him now by feeling that ‘pain’. Thank you for encapsulating what all of us have felt. Thank you for writing this. It puts into words so many things that I’ve been feeling. My little boy is 5 months old and was diagnosed with Down syndrome at 10 days old. While I still have moments of sadness and anger, for the most part I am just overwhelmed with the joy he has brought to my life. His giggle is his – it’s not because of Down syndrome., it’s just because he is who he is. Getting to know him beyond the diagnosis has been one of the best things to ever happen to me. I feel so lucky to have him in my life. Thank you for this post. Much to like. One of my favorites is that while the medical facts can share what is meant by those facts, they cannot share what your child will mean to your family and others. AAPLOG featured it in their e-mail and many friends who are fellow parents have shared it on Facebook. I hope this post is found high in Google searches by moms just finding out. Just beautiful…I cried every second reading it… you go Mom!!! I too am a Mom of a VERY SPECIAL girl 🙂 When we got the diagnosis after she was born I was devestated, but my husband told me not to worry “she is perfect” – we just had some research to do. I did the research & got scared – the best advise I could ever receive came from my husband – “Don’t focus on what she might not be able to do, focus on what she CAN DO!” That perspective changed my outlook completely 🙂 I am happy to say we have 9yrs under our belt of WONDERFUL ACCOMPLISHMENTS! She is truly “our sunshine”. We couldn’t imagine life w/out her & her 2 younger sisters – She is a GREAT Big Sister! My baby is due in 5 weeks. We have a “raised risk” of DS, according to the tests. We decided not to take any other tests. Whatever “flavour” our little one is when he or she arrives, we will thank God for him or her. This article and (most of) the following comments reaffirms that we did the right thing. Take the best of the information on this blog and ignore the negative. I have two beautiful daughters — the younger one who is 13 has DS. I was fortunate to have a prenatal diagnosis because it gave me time to “grieve” for what might have been. When my daughter was born I was able to welcome her with joy without the shock of diagnosis. I won’t lie to you and tell you there won’t be difficult days and endless worries, but that comes with having all kids!! My daughter is funny, stubborn, loving, happy, has friends, loves to shop at her favorite store – Old Navy, was in her annual dance recital last night, was on a special needs cheer team for years until SHE decided she wanted to quit, she loves music – and nothing gives me more joy than listening to her singing at the top of her lungs while riding in the backseat while I drive her to school! Today is Father’s day & while at a restaurant having brunch I spotted a young lady with DS and as we left her dad saw my daughter and gave me a knowing smile. If you child has DS I’m sure you will have similar experiences. I have met more wonderful people because of my daughter. She is interested in meeting new people and have new adventures! Wishing you all the best with your baby. Beautifully said!!! Thank you! I too have a daughter with Down syndrome. You vocalized my world just 10 weeks ago. I went from weeping with fear and disspointment to walking around with a full heart all day long. I love my little monkey and know she is going to be just fine!! I have a 10 year old amazing young man with down syndrome. He lights up my life each and every day. I too found out after his birth. And, if I had it to do all over again, I wouldn’t change a thing! One of the most touching things I’ve read in a long time. Beautiful. Plain and simple. I love this story about your Kate. I work at a Elementary school where we have a Katie we take care of, she is 7 years old with DS but we never treat her any different. All of our kids we care for are all treated the same. She is a bubbly active girl that brightens up our day, sure she has her moods but we all do. I wouldn’t change anything about her. Thank you for your post. My son is 1 month old, and like you, I was told he has DS minutes after becoming a mom. It devastated me. In the past four weeks, I have gone through many emotions. I have grieved and I have rejoiced, and EVERYTIME I look into my beautiful son’s eyes, I am overwhelmed by God’s perfect grace. While my journey is just beginning, I am so excited to see my savior reveal Himself to me daily in this perfect little boy. Reading blogs like yours reaffirms how truly precious children are in His sight, and I am so glad that He chose me to be this beautiful boy’s mom. The journey continues…. Believe me, your new little son will reap you so many ‘rewards’ in life that you won’t believe it! Take each day one at a time, and God will bless you and your child beyond measure! The journey, as with any other child, is not without its challenges, but oh boy, the rewards so-o-o-o outweigh them! I CAN SPEAK FROM FIRST-HAND EXPERIENCE! God bless you! Thank you..you wrote what has long been in my heart but could not express as well as you have done. Our wonderful Carolyn is now 18 and we can honestly save that God only gives good gifts and she is most definitely one of His very best. From a dad of a son with Down Syndrome, not sure I could have captured the sentiment any better. Well done. I enjoyed your beautiful letter and just wanted to thank you for writing it with such love. I am pro-life, and I can’t imagine that someone would ever take the life of a child if they were diagnosed with Downs Syndrome. All children are a gift from the Lord, to be loved, cherished, and enjoyed. Thank you for your wonderful outlook on life and sharing it with others. I know your letter will have meaning for many others who might find that their child will be born with Downs Syndrome. I wish all the best for you and your family. WOW beautiful glimpse into both of your hearts may blessings continue to flow in your lives…. This is beautiful Lauren. It should be pinned on the front door of every planned parenthood office. My brother had Downs and I was so blessed to be able to care for him for many years after our parents passed. They were the best years of my entire life. I was the best me when I was with my brother. No one every loved more than Bob, and no one ever conjured up more smiles and laughter in everyone that crossed his path. Sadly I lost my brother 2 years ago. He left an emptiness that will never be filled. I can’t wait to see him again in Heaven, shining brightly for Jesus. Suzi, if you want to share with some other members of the same ‘special club’ we have a bereavement group on Facebook for anyone who has lost a loved one with DS, whatever the reason. Contact me if you want to join. Please do not leave out fathers. My little heart would have been forty this year. Song by John Denver. When I am gone who will remember that love. Roger, if you want to share with some other members of the same ‘special club’ we have a bereavement group on Facebook for anyone who has lost a loved one with DS, whatever the reason. Contact me if you want to join. Awesome article, and as I finished, the instant I saw the picture of your little one and my heart leapt with love/gratitude/joy/tears and almost a weep. What a blessing. Thank you for writing. To me Kate is unlimited love, an unlimited smile. She holds nothing back and smiles with her whole being. She does not need the worlds scripts telling her what she should or should not think or feel. She shares her love openly regardless if the one in front of her deserves it or not, if they offered love to her or not. When she sees another person…she smiles with all that she is, and to me in that moment I realize a new depth of how I could openly love. Thank you Lauren for sharing these thoughts. You have a beautiful heart and have changed many lives in your love here. I too have a gorgeous daughter who has Down syndrome. She was a month old before we knew she had Down syndrome as I have another genetic condition which has some of the same features. I too was devastated as society had told me that that was going to be a bad thing. But you know what, it isn’t. My daughter has the best spirit. She is in mainstream school and coping well. Yes she has her challenges but so do my other children. My daughter is loved by all who meet her and she entertains us no end. These children are a precious gift – there is no reason to be scared of the diagnosis of Down syndrome. I have the pleasure of working in an educational establishment that welcomes and encourages people of all abilities, where all students are equal and treated with respect. This includes many students who have a range of additional needs and challenges. It is only right that within one campus we have students from all walks of life, studying at all levels from access courses to degrees, sharing the same food hall, the same classrooms, the same corridors, the same support. This is not integration – this is just normal – as it should be. Lauren, you so beautifully summed up exactly my thoughts on this! Would it be okay with you if I reposted this on my blog for my readers to see? Thank you for posting. This could have been my story except insert a little boy instead of a little girl. You are hit with all the things that can go wrong and that is overwhelming in the beginning. But the child behind the diagnosis has left an impression on everybody he meets and opened their eyes to what DS is about. To me it is just part of who he is like his hair color and eyes. There are plenty of “normal” children who have complications from a host of different things — they are all just children who need love and nurtured. Beautifully worded. I’m sure that these words will provide much-needed encouragement (and more importantly, hope) to many struggling new moms. You are so right about what a blessing a child can be…not just to your immediate family, but to all of your extended family and friends, too. After a while, too, the fact that a child has Down Syndrome ceases to be how you think of or define them and they are just your precious, much-loved child! I have a 4 year old nephew who has Down Syndrome and he is definitely the rock star of our entire family, church, and community. In his short 4 years he has been a blessing in the life of everyone he comes in contact with. I couldn’t imagine a life without him, but I do know it wouldn’t be as sweet, funny, and bright. Absolutely beautiful and touching, God is Great!!!! Not going to lie, this made me tear up a bit. So beautiful. I have a cousin with Downs Syndrome and I find myself wishing I could share his story with everyone. He is, quite frankly, awesome in every way. He is now grown, in his twenties. He works at a Dog Daycare and volunteers around the community with my mom and aunt. When I watch him navigate through life, this grown person who I always remember as the little boy from my childhood, I am so proud of him and filled with love. I don’t know what it’s like to be his mother, although she’s probably one of the most awesome women I know (if not THE most awesome) and someone I can always count on to be there when I need to talk – but I do know that I can’t imagine my childhood, or my life, with out him. Like you, I received my son’s DS diagnosis at birth. I felt as though I had been punched in the stomach. I had waited 43 years for this baby and was heartbroken. How little I knew that he would be the BIGGEST blessing I could have received. Your story sounds so much like mine with the exception of he and she. :). Thanks so much! Thank you for sharing. I see that Kate has taught you, your family and friends something special. Lauren – I wish my grandmother could have read your amazing letter. She died 4 years ago this month at the age of 89. Her son, my uncle, was born with DS. He is a fabulous, funny 62 year old man these days. It was 1951 so the doctors told her to institutionalize him. She and my grandfather did no such thing. He went to school, he took swimming lessons, he read his favorite magazines(TV Guide and Sports illustrated) on car rides to my house as a child. Who would have thought he would outlive his mother and STILL be going to work and being productive today. No one in 1951, that is for sure. He has some small health issues and mild to moderate demensia, but Gerontologists see him twice a year. He is paving the year for them to learn how the mind and body of people with DS ages. My grandmother was his champion her entire life and his quality of life was amazing because of it. I must say, I too watched my ultrasounds when I was pregnant, knowing I might possibly be at increased risk for having a baby with DS. I loved reading your letter so much seeing how the whole perspective on DS has changed since I was born in the early 1970’s and grew up with a family member with DS. My uncle is the best, I am sure you will look back 60 years from now and experience great joy in woman Kate becomes. And kudos to you for reaching out to support other moms…..
You know all of us who are parents are picked to have little angels to raise and protect and nurture and then let fly. Some of us like you are chosen to raise special angels. These angels teach all of us it is ok to be childlike throughout life, to enjoy the little things. To reach out and love those around them. You my dear are blessed beyond belief. You are an inspiration to those who like you were chosen to be blessed with those special angels. You made my day :)God bless you. I too had tear at the end. Like you, we had no clue our 3rd out of 4 children would be anything other than what we “expected”. She is now 23 & brings joy to all who know her. You expressed my life & feelings in your blog! If I could write as beautifully as you, this is exactly what I would have said!! Our son is 13 and has Down Syndrome!! It truly has been a lovely journey and we feel wonderfully blessed!! I am so thankful that God chose us to be his parents!! I just want you to know that I have been blessed with a grand Niece Miss Poppy who is five now and has given us more than we ever ask God for. She brings a smile to our family with every thing she does and accomplishes. She is a gift from God. What more can I say. thanks you Jesus. As a special ed teacher and an parant this warms my heart and bring tears to my eyes. I know how amazing children with all kinds of needs can be. I believe we are given what we can handle. If people choose something else for a myriad of reasons, then so they choose. I believe in choice. An the special kind of magic that a child who presents as “more” than expected has , more charming, more artistic, more intelligent….I believe this magic needs to be appreciated/celebrated by a certain sort too, doesn’t it? We know there are parents of kids with needs who aren’t celebrating them. It can be a hard life and without support and perhaps, without some spirituality, valuing this difference can be an awesome task. As I said, I am a special ed teacher and my own children do not have this kind of anomaly. I don’t walk in these shoes, but I do live a closely parallelled life and know the challenges that can be there. I see it daily. If you are in these shoes and don’t celebrate, if this article make you feel guilty, then change something. Look outside your circle for the support. Find the spirituality….its there somewhere, not really needing a name. Do what you need to do to find the reason to celebrate because whatever your child is like, s/he deserves it. You deserve it. Thanks for sharing. We lost our dear little 4 year old down syndrome girl (blondie like yours) just last fall (croup–pneumonia after just 3 days of being sick.) I never regret having her, and also found out her diagnosis at birth–even with all the ultrasounds these days. Being our 11th child, we knew it could happen–and were prepared, as much as you can be. There is so much support now, and we did not feel alone. Thanks for your words–and reminding me that we are still part of this special club even though we have lost her. Patty, if you want to share with some other members of the same ‘special club’ we have a bereavement group on Facebook for anyone who has lost a loved one with DS, whatever the reason. Contact me if you want to join. I have a granddaughter with Down’s which we also did not know until she was born. Now she is a beautiful little 2 year old with a bright smile that lights up her face. Thank you for sharing your story. I gave birth to my son, Jason, by emergency C-Section and was never told that perhaps there would be many problems to deal with in the future. Because he was diagnosed with Asthma on his lst Birthday and for 1 1/2 yrs. was hospitalized almost every 3 weeks for days it was realized by the doctors after many visits that he appeared to be behind in devlopment and suggested having him tested at age 3. By 2 1/2 as he was not walking I pressed my family Doctor to schedule test as soon as possible. After 7 weeks of testing we were told that he was mentally retarded due to lack of oxygen at birth and that we should place him in an institution as our lives would be ruined. I said no that he would not be placed in an institution at that point, that perhaps that day might eventually be but not now. We lived in a small town and I had many volunteers that came into our home every day to perform a program called “Patterning” for 1 1/2 yrs. It consisted of performing certain movements and exercises, etc. several times a day for hours on end , and repeated over and over again, part of which was taking him back to crawling, creeping, rolling and many other parts of developmental skills that disabled children do not perform or go thru. Patterning was performed by putting the child on a table, one person to his head and one person on each side of his body and moving his head and body in what was almost like the swim position, in order to stimulate every part of the brain. I knew from my research that more success was reached with severely disabled people and actually had the opportunity of meeting a success story when I took Jason to Philadelphia where there is a centre for brain injured patients and patterning was developed. Jason started to fight the program after 1 1/2 yrs and although the patterning centre recomended that I continue patterning I decided to give it up as I wanted Jason to be a happy individual that other people enjoyed and cared about. It was quite incredible tho as to how the program did increase many areas of Jason’s development. Thru Jason and programs that he was in over the years I had the opportunity of meeting many Downs Syndrome individuals who were absolutely delightful. Jason has been the delight of my life and I have learned so much over the years by having him in my life. Thank you very much Lauren for sharing your story, which I am sure was very insightful to many Mothers. God bless you for being such a wonderful and loving Mother. bravo a votre courage a votre amours, et dans ces temps difficile vous nous donnez tout simplement une belle leçon de vie d amour d espérance.tout simplement merci . Lauren…reading your words was liking reading my own story of the birth of my daughter Lily 8 years ago, the emotions, revelations, and inspirational journey since. Like you, I can’t imagine life without her…and the gifts she has brought to our lives clearly outweigh any challenge we’ve experienced along the way. Thank you for sharing. I couldn’t have said it better myself. My beautiful daughter Jenny was born with Down syndrome almost 26 years ago (birthday June 19th). She keeps me grounded, when I may be having a bad day, all I have to do is talk with her and it makes things all better and puts a huge smile on my face. She enjoys life each and every day! Everything is “new” to her as she finds new ways to enjoy some of the things she may have seen and done many times. She can watch a movie 300 times in a row and she enjoys that 300th time as much as she did the very first time she saw it. I love her with all my heart! your story is soo fresh and familiar to me. my lil angel was too born with Down Syndrome and my doctor nor i knew till she was born. as a single mom now of 5 it was very hard at first and all i would do is look at her and cry telling her how sorry i was. i wondered if i’d ever be able to look at my daughter and not cry because of it. today she is 7 months old and now the only reason i cry when i look at her is because she is soo beautiful, and i am sooo proud of her. she has no real health issues associated with Down Syndrome: no heart defect, no GI problems, and so far no ear or eye problems. her motor skills are right on target for the most part and her muscle tone is extrodinary. she has my strong will and drive i think or at least i hope. i too wrote my own lil story. i have a couple things i say : ” i may not have a partner in life but God sent me my lil partner for life” and “her having Down Syndrome wasn’t exactly what i expected but she’s exactly what I wanted” when God gave me Khia he gave me exactly what i wanted another beautiful daughter. i thank God every day for his blessings. I’ve achieved all that and more. So all you parents who have a child diagnosed with a disability through pre-natal testing give your baby a chance to prove the doctors wrong. To Bob: I hope you realize not all disabilities happen at birth. An accident or illness could put you in the same position I’m in and I don’t think you’d cope very well!!! Thursday was my last day as a teacher of children with developmental delays- I have had many students with DOWN (without the “S”) syndrome in my 38 years. They are loving, stubborn, happy, frustrating and loveable. I have watched many of them grow into productive young men and women and also watched as several left this world because of their medical issues. They have taught me so much as I tired to teach them- I will never forget the Saras, Carleys, Sherrys and on and on- thank you for enriching my life and letting me teach them to be independent and responsible young men and women who were delightful and precious! We had a prenatal diagnosis of Down syndrome with our little 3 year old peanut. I was devastated, angry and afraid. The one thing I always feared was having a child with a disability. I wasn’t sure if I could be a good mom to this little girl. Then one day my brother told me ” God doesn’t trust just anyone to raise a child with Down syndrome. HE CHOSE YOU !” I realized she was our gift from God and our opportunity to serve the Lord by raising her. We got to know her early by watching her on our sonograms. She became very real to us and we were very attatched to her before she was even born. She was like any other baby on sono with the exception of her heart defect. After I kissed that beautiful little face in the delivery room, I knew everything was going to be just fine. She’s not a child with disabilities. She is just Sara, the way God made her. Don’t be afraid of this diagnosis! It is life changing, in a wonderful way! compete in figure skating. I got 2nd place and 4th place. Beautiful story, thanks for sharing! My sister gave birth to a baby with Down syndrome 34 years ago. Doctors told her to put him away and forget about him – have another child. Fortunately, Robert’s parents said he is a gift from God and they would never ever give him away. Today, Robert is the Founder of IDEAL WAY, and an internationally acclaimed motivational speaker who has presented to over 100,000 in more than 60 cities across NA in three years. There are no words to express my special relationship with Robert. Most of my life was spent teaching Robert. I know who deserves to be on Time Magazine’s list of most influential people – Robert, my nephew and teacher. I have been blessed with the opportunity to work with special needs for the last 8 yrs. I know Downs kids are beautiful. But did you know they are beautiful “all growed up?” Yes they are. They have the sweetest most giving hearts of anyone I have ever known. They are straight forward and sooooooo loving. As a mom, grandmother and great grandmother…this makes my heart hit that special beat reserved only for the ones you love. For a short time, we thought one of our grandchildren was going to be Downs. I know the weeks of waiting were hard on the parents. I was working with special needs kids (8yrs-92yrs) and thought my heart would burst with the thought of having a Downs child. All children are beautiful…but I think God gave Downs kids…well a little special spark…like no other. Dear Lauren: One day after the Father’s Day, I came across your letter to the mothers-to-be of downs syndrome child. I have been a heart surgeon for children since 1972 and have seen and treated many children with Downs syndrome. In my recently published book, Healing Hearts, one chapter was spent for a patient with Downs syndrome. This young man lived with dignity and nobility for nearly twenty five years teaching everyone who had a close contact with him (I was blessed to be included). Although I was blessed with five children (with probably normal chromosomes), I have also gone through an experience which made me yearn for what used to be and be “normal.” My second son, a physician, was killed in a brutal accident in a hospital elevator. I have learned to live with new “normalcy” which is different from the past and for a lot of other people. Thank you for sharing your loving thoughts. God bless you and your family. Hisashi Nikaidoh, M.D. Such lovely words! It is so how I felt the day my little Jenna was born. But she is a blessing and she is achieving things at a rate that just keeps surprising them. She is a beautiful girl and couldn’t imagine a day without her. Terrific column, Lauren. This is Dave Andrusko, editor of National Right to Life News and our blog, National Right to Life News Today. Would you be so kind as to allow me to reprint Kate’s story? Thank you for sharing. What a beautiful reminder to all parents that our children are each special gifts. We are all so very bleassed. Your thoughts inspire me. What a beautiful article ! It is parents like you who keep me working so hard. I started Paper Clouds Apparel to raise funding for special needs schools and organizations while showcasing the amazing artistic talents of those with special needs. Plus we hire those with special needs to package ALL our shirts. I would LOVE to team up with you and help a special needs organization of your choosing. Hope we can chat soon. I too have a son with downs. He will be 13 this year. I loved reading this as it reminded me of the day my son was born. We have a 4 year old boy with down syndrome, we found out during the prenatal and it was as you say devastating. The above statement “Welcome to your beautiful journey” is such an accurate reflection of what has happened since, our son Nicolas is full of beams and bring so much happiness with each new development or discovery as a child, he and his older sis are best buddies and cannot be without each one. When I have a sad or bad day, he comes grabs me by the hand and says “Dad” and hand signs he wants to go play and off we go! He knows how to cheer me up quickly. I admit that it was difficult to see how it would be a beautiful journey at the beginning to anyone going through this stage, but you have to walk the path to appreciate the stunning beauty that is in the heart of a child with Down Syndrome. I am the third generation of my family to work at the same facility for persons with intellectual challenges. My tenure is now nearing 36 years. I have known, do know, and hope to know many more. Many of them are those that are ‘rocking’ that extra chromosone. Some things i know are they have smiles you can’t forget, hearts as big as mountains, and face challenges as if they were a ride on the merry-go-round. Life for and with them is like tasting all the wonderful fruits God gave us everyday, it is as if the fun way is the only way, and it is hard to see life any way but their way. Enjoy the wonderful journey. In 1989 on my birthday, I gave birth to my second child and within hours was being told the same as you, although at the time he wasn’t in my arms but in the Special Care baby unit. He had heart and bowel defects and a few days later we were off to the world reknowned Great Ormond Street Hospital for his first surgery to perform a colostomy. It was hard, I was devastated and frightened of what the future held for our family which included his 15month old brother. Over the next 14½ weeks he was back and forth between Great Ormond Street and our local hospital with many issues and a second surgery, this time on his heart. Finally things started to settle down, he was gaining weight and then something even more devastating happened – he died – and I realised that losing him was far more of a tragedy than anything that life could have thrown at us over the coming years if he had lived. Those short weeks together changed me: changed my perspective on life, made me appreciate everything I have and every moment I share with family and friends. I have been so lucky because as a result of my experience I have come to know some of the most amazing families across the world and some of the most inspiring individuals, who happen to have Down syndrome. I was truly blessed to have my son and to see things in a different way to how I did before. I would not condemn anyone who decided not to have their baby, it is a very personal decision and we are all individuals with different religious and moral beliefs, different upbringings, different levels of support and family bonding. But what worries me is that some people are still being given outdated, biased information to make their decisions. When given a prenatal diagnosis, parents need to make an informed choice based on balanced information and without personal opinion from outsiders – medical or otherwise – and then they need to be supported in that decision, whatever it is. I am glad that I did not know before my son was born as I am honest enough to admit that had I been faced with a prenatal diagnosis and presented with some of the information that families have relayed to me, I am not sure that I would not have opted for termination and made the biggest mistake of my life and missed the indrebible journey of the past 24 years. We have two sons who happen to have Down Syndrome. Sean is our 6th birthchild. When he was 8 yrs. old we adopted David, then age 12. They are now 34 and 38 yrs. old. They keep us young and we delight in them as do their 5 siblings. It HAS been a beautiful journey and thank you for your wonderful story! This is just a beautiful letter … truly. From one “sorority sister” to another … welcome to the beautiful journey! As a single Mom myself to a wonderful 22-year-old son who also has Down syndrome, I commend you for writing this. IT IS OH SO TRUE… EACH AND EVERY WORD! But I have also heard from so many others how he’s truly affected their lives… that they love to watch him “sing” and raise his hands in church, swaying back and forth to the wonderful music. That his sense of humor, cute smile, and silliness is infectious. That he always asks to “wait” in the care when I pull into the WalMart parking lot to go shopping. (Guess that must be the “boy thing.”) And he truly loves his older sister — and yogurt! I know now, 22 years after the fact, that God gave him to me for a purpose. And even though he’s not what others would remotely call “high functioning,” he is his own person, special in every way imaginable. I am blessed beyond words. AND I WOULDN’T TRADE HIM FOR ANYTHING! You wrote the words that are in my heart! My son, Jamesyn was diagnosed with Down Syndrome when I was about 16 weeks pregnant. We had so many “options” and so much stress trying to decide the future of a child that isn’t even born yet. I don’t know if it’s harder to find out at birth or while still pregnant but regardless, none of it matters once you see your child for the first time. I have a friend who is into his sport here in Dunedin, New Zealand and he has Downs syndrome as well and has full time work. He also drives his own car. Another thing that Hugh does is take part in The Special Olympics. As I am in the mature age range I take part in the New Zealand Masters Games and I tell him that I call it Geriatric Olympics. he has a good old laugh when I tell him that. My daughter was diagnosed with Noonan Syndrome shortly after birth. Although I didn’t quite understand what it all meant, I found out pretty quickly! Nothing really prepares you for a child with “special needs” and the challenges that come with it. However, I would not change anything for even one day or minute. She is the most loving, positive and amazing little girl. Everybody that meets her just simply love her. She is a blessing and a inspiration to all. Thanks for your wonderful blog, it was most encouraging. 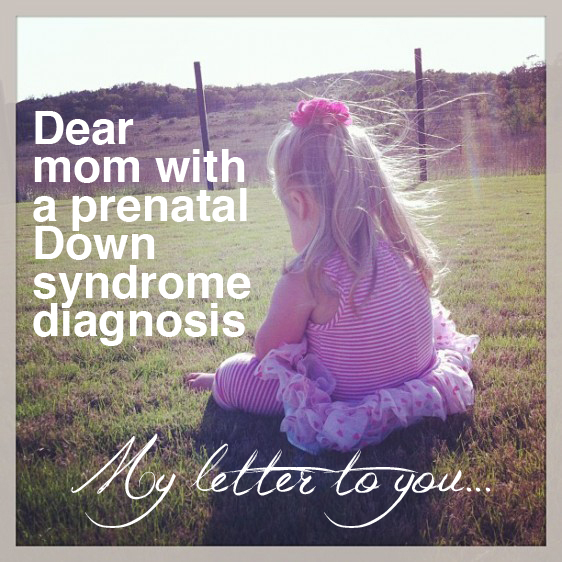 Dear Mom with a prenatal Down syndrome diagnosis… | F.R.I.E.N.D.S. Beautiful and perfect post that encapsulates what we all feel, how much better our lives are with our children with DS, the extra dimension they bring, the fact they are not just a chromosome or a set of medical liklihoods. Beautifully put. I remember the days when I wondered if we’d ever find normal again. It didn’t hit me until around age one, but then it packed quite a punch. Would there ever be a time when our life wasn’t eclipsed by Down Syndrome? Your post got me thinking about it… I even wrote my own blog about that. So, thanks for the inspiration! I’m a doctor working in the developmental paediatrics unit of a hospital in India. I would just like to say that what you have written is so very moving in its simplicity and,well, truth. I see so many parents every day who look past their fears and start the process of lviving and loving their ‘special needs’ children; and I have seen the joy they find in their beautiful kids. With your permission I would love to share this article with my colleagues and my patients. I forgot to comment on “Dear mom with a prenatal Down syndrome diagnosis” in my previous comment…. Another reason I work in this field… love it..
Dear Mom With a Prenatal Down Syndrome Diagnosis - A lovely blog post. Wow. Thank you. My little man is due in August. We can’t wait to get to know him and to join you on this most amazing journey. I will share this beautiful letter with all the college students I teach in the field of Child Development. Your parent to parent letter will make the textbook come alive for my students. Thank you thank you thank you. My younger sister has Autism and she is the most incredible blessing of my life. She has made me the best version of me and I feel certain the world would be a little darker without her light. Often, when I tell people I have a sibling with a disability, all they know to say is, “I’m sorry.” But I’m not sorry. She is an angel and I feel so blessed to have her in my life. I’m sure you’ve read “Welcome to Holland” by Emily Perl Kingsley, but it has always been my favorite way of describing having a sibling with a disability. It makes my heart so happy! Such a beautiful letter. As a father of a 5 1/2 year old girl with Down Syndrome, I can attest that she is the light of my life. She has 3 older siblings, and countless other aunt’s, uncle’s, cousins. She has brought such joy into eveyone’s life that she touches, it truly is amazing what this girl can do. My wife and I feel so very fortunate to have been blessed with her. Thanks for sharing your personal story. Ditto, from a Mom who has adopted two sons with Downs Syndrome. Can I please, please, please have permission to print this & hand it out to new parents? I work at a hospital & delivered my baby there. She stayed 6 long weeks in the NICU. now, 3 years laters, I still keep getting asked by the nurses to please see some parents that need encouragement. I would love to print this out & hand it to them as it has put my exact feelings into a beautiful poem. I was amazed to read your article in today’s Chicago Tribune, a newspaper NOT noted for being pro-life! It is clear from the responses, that here are MANY people out there who share your respect for all human life. Keep up the good work! I read your article in the Chicago Tribune and think it should be required reading in schools since there is so much intolerance of anyone with any type of “difference”. After 6 years, my grandson was finally diagnosed with Kabuki Syndrome (a mutation of the MLL2 gene) and has some similarities to DS. These kids have such a love for life and can teach us all about love and acceptance in spite of our differences. I just read the most fantastic article that the Chicago Tribune has ever published! What a beautiful and well-intentioned article even though you were simply speaking from the heart. Thank you for sharing your experience and hopefully mothers and fathers who are in the same circumstance can feel reassured and comforted by your words and fully enjoy the journey they are about to undertake. I sipped a lemonade at lunch in your honor. Thanks again for this beautiful piece. I have a special-needs adult son who is 28 now. I’ve learned far more from him that I’ve ever learned through any one or any educational system. I’ve learned how to pray harder and more passionately, I’ve learned how to love more fearlessly, how to give without hesitation, and how to laugh with freedom. He may never be “normal”, but I wouldn’t trade him for “normal”. One of the greatest gifts about special needs children is they see the world through God’s eyes, and if we can just take a moment and join them…we’d have a very different world. This is such beautiful article!! I have tears in my eyes even now as I write this. I have a little daughter who turned 4 and we also found out after she was born that she had Down Syndrome. She was our first child and I remember my heart breaking after I found out that diagnosis. I remember feeling like all the dreams and hopes I had for her were shattered in a moment. However in the past 4 years she has taught me more love and compassion then I ever thought possible. 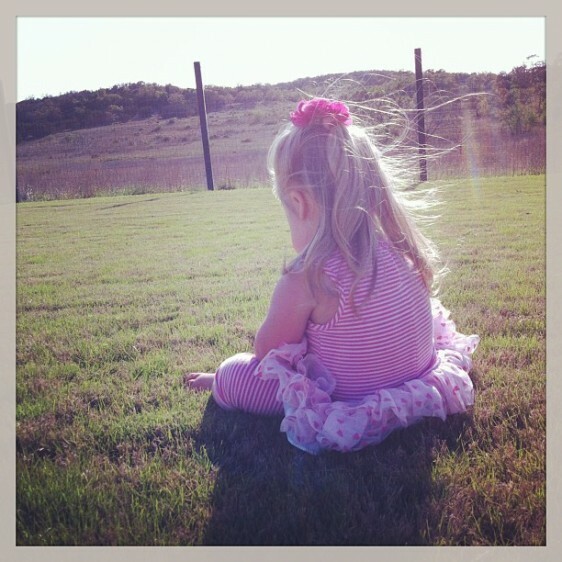 I would trade her for anything….she is my princess. Now along with her two younger brothers she is a big piece of what completes our family. Everyday she amazes me with the things she does accomplish!! I grew up with a younger sister , Amy, with down syndrome. I have been blessed with a sister who is funny and sweet. She has enriched our lives. My husband has loved and cherished my sister. When we were told of our high markers for having a child w/DS, we weren’t upset. We knew if anyone could handle this news it was us. We did have a child who was not DS. I cannot stress enough the news of achild being born w/DS is not what you necessarily expect, it is not devastating. My sister is 37 y.o. and is the best member of our family. She has brought such happiness to the whole family. She is happy and perfect in her own way. Would not change her for anything! H Lauren! I met you and your family in the Timaron park today at the splash pad! I just wanted to comment to tell you that you are a beautiful writer! It was such a sweet part of my day to connect with you and your family! Thank you for writing this! Beautifully done! My son Henry is almost three and has DS. He has got to be the biggest Fresh Beat Band fan in the world….I laughed when I read that your daughter is a fan too! It’s the only thing he likes to watch and today we are picking up his orthotics that are custom made with the FBB on them! I too love the community/family we’ve entered because of him. My husband, our daughter and I are truly blessed. The truly heartbreaking thing is that up to 90% of pregnancies where DS is diagnosed end in abortion. A friend of mine who has an adult child with DS said it has been a very long time (years) since she was called to the hospital to counsel new parents of a child with DS. An end to a special kind of joy, diversity, blessing. If you are truly pro-choice, you would be asking the baby to choose. The life impacted by the “choice” is his! Your choice is who will care for him, you or an adoptive family. All babies are wanted! There are many parents to choose from! I chose to deny prenatal testing. The baby is mine and if there was anything that needed attention, we would take care of it after I got a chance to love my baby. When Beth was born, I saw the signs of Down syndrome. The information I received was outdated. I mourned the loss of the dreams I had for her. Then we moved on and watched her exceed all expectations for her! She has had and does have her share of medical issues, but so do other people! When Beth became a big sister, I noticed that her little brother had signs of Down syndrome too. The NICU doctor had a joke, with Downs everything is down. Nope! Not funny… He was so negative. But I had been down his road for a while now and new more about Down syndrome than he did. I lived it daily! So, when Ezra was born, not a problem! All it meant to me was like a difference in eye or hair color. As some else put it, a different flavor! There is a place in this world for all children! We teach them; they teach us and we all become better. We should treat all as a child created in the image of God and give them due respect. I’m so blessed when people treat my children as equals and love them for who they are. Down syndrome does not define my children, but it gives me a clue as to what I might find that needs attention. We have a new normal and it’s just fine! Nice to see you here Penny! It’s been a long time since I was on Downs-heart. As I read this story, I wept uncontrollably. Not out of sadness for Lauren or her family because of her child’s diagnosis as it is clear Kate is loved beyond measure and is right where she is meant to be. I cried because this family and every other mom who has the opportunity to hold their precious newborn child in their arms and gaze into his or her eyes with delight and feel that sense of overwhelming love coming out of a place they never knew existed (regardless of any health condition) has been blessed with an amazing gift of life that people like me who cannot have children will never ever experience. I don’t say this to garner sympathy; I say this because I want moms and dads to be reminded at just how BLESSED they are to be a “Chosen One” – someone chosen and entrusted by God to raise His angel(s). This is a HUGE undertaking and responsibility – esp. when a child is born with health issues – but for those hand-picked by God to do the job, I see it as a “calling” that I wish more parents would appreciate as that and embrace the challenge. As a 43 yrs. old single woman who has never been married and has no children, I recognized about 10 yrs. ago that it was not part of God’s plan for me to be a mother (to children born to me or adopted) and although I fought this for a long time, I’ve since (almost) fully accepted it as what is meant to be for my life. Health issues of my own led to me having a full hysterectomy in 2008 so now bearing children is clearly out of the question. Yes, I know I can still contribute to the world and make a difference in other ways, but there is and always will be a void in my heart knowing that I will never be able to create and carry a human being inside of me that will live on as my legacy after I’m gone. There are so many emotions related to my struggle that I won’t share here but suffice to say Mother’s Day is a very difficult day to work through. Most of the time I feel like I’ve truly accepted God’s plan for my life and I don’t really feel *angry* at God for depriving me of the opportunity to be a mom but it’s moments like this – when I read such wonderfully moving stories of people who have been faced with difficult decisions about their children (both pre and post birth) and have accepted God’s calling to raise their special-needs child or children that I am overcome with emotion. It’s because I’m overjoyed at the great insight these parents have and how grateful they are to even have a child – special needs or otherwise – and that they “get it” and appreciate and accept “the Calling”. Just welcomed Henry James into the world June 18th! We didn’t know if he would have Ds or not, but he did and we have been blessed beyond our wildest dreams…how can anyone ever think an extra chromosome is worthy of death is beyond me. But of course, even completely healthy babies get aborted each and every day, so it shouldn’t surprise me. But, not my baby! He’s the softest soft there is, smells like heaven and is incredibly yummy! 🙂 My best friend! Some years ago, I worked as a phone tech for our city. One stop will always stay with me. There was a gymnasium with an extra room. I arrived ready to repair the phone line issue and walked into a room with a lady, I would say in her 30’s, and about 20 young people all with DS. They all appeared happy to see me…I was the new face in the crowd and one young man in particular kept coming up to me to shake my hand. Each time, I returned his smile and shook his hand. I left thinking, in all my years of doing telephone work, this is the 1st time, the whole room was happy to see me. I’ve been invited for dinner, dates and the like by customers when I worked for the phone company, but when I came across this City operation, it left me with an appreciation of the young folks. They made my day. Just thought I’d share that with you. God Bless. I was so touched by the story that I wrote a response that we had when our little grandson was born with Down Syndrom. The letter was full of all the wonderful attributes our little Billy has; and the joy he brings us as we join him in his journey. However, I have lost the copy of the letter and I don’t see it published here ( it would have been written in the first two or three weeks of July) . Do you know if you received it? And if you did is there anyway I can get a copy of it? Thank you for your help with this, and I really loved the story of the pre-natal diagnosis of the baby with Down Syndrom. I’m so sorry for your loss. I have no idea how difficult that was for you or your wife. I’m also sorry for all the hard things spoken to you. Lord forgive us for we know not how we hurt others. There but the Grace of God go any of us. “and so it will go with you”. I only wish. My prenatally diagnosed son died before he was 3 weeks old. We fought so hard for him, love him so very much. Everyone in the DS groups after we received our prenatal diagnosis told us how wonderful it would be, everything would be ok, what an exciting time this was for us. I think there needs to be some truth about the very real health effects that Trisomy 21 can bring to our children, not to scare prospective parents, but we were utterly blindsided by our son’s death. You know the trip to Holland analogy? With a prenatal diagnosis, we planned for Holland, bought tourbooks, got the full guided tour. Then the plane crashed. But, I would do it all over again, in a heartbeat for him. He changed our lives forever. I have a beautiful 4 year old daughter with down syndrome and she has changed our lives. I wish i had the ability to put into words what you have expressed so eloquently. You have summed up exactly what i would like to say myself. My daughter already knows the alphabet, she sings songs and nursery rhymes all the time. We often only show her once how to do something and she is so keen to get involved. She loves to dance and play and is always happy and full of fun and without a care in the world. She has started mainstream school this week and she is already the most popular girl in the school everyone is looking out for her. She loves and is loved and she will have an amazing life. Who’d going to show up next? this left a really huge mark on my heart. i actually had o care of one in elementry and wow he meant the world to me. he was so sweet and so cool. tey have their moments when they act the way they act but i mean you get use to it and you face the fact that god has given that child a gift. What is the magic sauce? I just came across your blog post. This is beautifully articulated. And so true. I wish every mommy with a prenatal diagnosis could be given a copy of this article. I think many might make a different choice after reading this. Pushed a lot more to achieve those successes. My girl has brought a roller coaster ride to our family at times but she had also brought a deep inderstandinnabout human compassion and understanding that I would never trade. Good luck with your special gift. I know I am blessed to have my special gift too. I would like to say how wonderful it is that we can use the internet to share with other our joys and sorrows . We don’t need to judge Bob Iam sure he and his wife made their decision on the advice of their doctors. And the fact that he is reading and commenting on this site shows that he has been affected by this decision and is looking for answers. This is an amazing letter for any parent. Thanks for sharing. What’s in a name? Grace. Your little one is a beautiful bright soul. She is very lucky to have such a loving mommy. I had the pleasure of working with many differently abled children from the time I was a teenager. One thing they all had in common; hearts of pure gold and a beautiful unconditional love for all that shined through the brightest of smiles. They saw only the good in everyone and every situation and I was touched and inspired for life. Bless you! Hi Lauren, As I was reading your story, it brought back such a flood of memories and reminders of the truths ( and MIS-truths!) that have come to pass! My son, Boomer, is 26 now and what a wonderful life we have had! As you said though, when he was young, I longed for things to be “normal” and just wanted all the professionals to just leave us alone so I could enjoy my son… One of the things you mentioned, was the breastfeeding issue. I absolutely insisted that I try to breastfeed. They set up a screen (for privacy) in the Neonatal Unit and by the second day, he was nursing like a pro. I too, am not one to accept it when someone tells me something isn’t probable…He walked at a normal age and started making some words at a normal age. When the therapists would say that he would probably not achieve some goals until a specific age, he would find an “un-typical” way to reach the goal before expected. There was always a flurry of doctors, teachers, counselors and other professionals in our lives. I look back though and appreciate the roles each and every one, had in our lives (even the negative ones!). They helped to shape who I am and most of all, who my son is! If not for Boomer, I would not be who I am today. He shows all he comes in contact with, how precious life is and that challenges are just a step up the ladder of life! Thank you for sharing you story so eloquently! Deb P.S. I have a Facebook site dedicated to Boomer that is called, My Life With Boomer, if you would like to check it out! Wow… this is powerfully beautiful. Thanks! Thank for this beautiful essay! I shared it on my Facebook wall. I am a pediatric home care nurse, and loved reading your letter and all the comments posted here! I have the privilege to care for special needs children and am so blessed to have this profession! As a future mom I thank you so much for pouring out your wonderful heart about your sweet daughter! I have a wonderful cousin with DS by the way :). beautiful, I have yet to hear a parent of a child with DS say anything negative about that child, what special special people these children with that extra special something are. Looking for “the one”? Don’t stop believing. amen, amen! my grandson has spina bifida and despite all the fears he is glorious! This is so beautifully written! Thank you for sharing! When I was 17 weeks pregnant with my son we found out he had a 1 in 10 chance of having Down Syndrome. The feelings and emotions I felt for the next couple days were all over the place. I wish I could have read this then. At an ultrasound a couple days later we found out he had died in utero and we were devastated (we later found out he did, in fact have Down Syndrome). He would be 3 years old now. Every time I see a family with a beautiful Down Syndrome child I can’t help but picture my son and wonder who he would have been. I’m sure he would have been amazing. I am ‘convinced’ that God only gives ‘special’ children to ‘special’ mothers. Think about it. It always appears to be the most compassionate and patient mothers that get that special gift. Having a cousin with Down Syndrome I know firsthand just how much ‘more’ loving these children truly are. The touching tender moments never cease to touch the hearts of those lucky enough to know them. It’s like God didn’t allow room for anything but ‘good’ in these children, so innocent. Those who spend any time around these children find they are more blessed for it. I have nothing but pity for anyone who doesn’t see this; feel this special love. God bless the parents of all children diagnosed with special needs. You are so amazing!!! Sending Love to fill your bucket. I am not a mother…so odd as it may be, I found your blog because of your “Just Do It” picture. Wasn’t I delighted to see what your blog is all about. In a world where people are critical, quick to judge and find reasons to NOT be happy….here you come, spreading rainbows, motivation, love, and inspiration to others going thru the toughest time ever. Raising a child is hard, as a parent you always wonder if you are doing the right thing, and if everything will turn out alright. Your letter is so touching, because when a Mother finds out PRE-BIRTH that her child may have DS, I’m sure she is devistated, hurt, “why me” and thinking she did something wrong…it’s all natural, then she starts hunting && I sooo hope she finds your blog. You are an amazing person. Again, pouring love into your bucket to compensate for all the love you are spreading. Be well, live a beautiful life, and blessings on all you hold near & dear. PS. I love your signature line, taking it for my signature because it is beautiful and reminds me that other people DO CARE!! This is such a lovely post.I wish I had met you when my child was little. It is amazing to me how your thoughts echo one’s I have had. We are part of a blessed circle, & I hope lots of mom’s read you posts. Hi i just found your blog. My little girl has Down Syndrome, she is 3. I could have written this post word for word. Glad I found your blog. Thank you so much for sharing this heart felt and inspiring letter. We have been diagnosed and it has been a whirl wind of emotions. We are finally in a state of happiness and excitement for our new arrival on May 20th, but also some fears and sadness. We are lucky to be surrounded by a huge support system of friendship, family, and love and I know the people that do not know yet will give us that love and support we will need from them. Such a heart-touching article/letter. I found out when my daughter was 3 weeks old the official diagnosis of what was called mongoloid (this was 56 years ago) baby. My husband was in the Air Force, & we were far from our family. Perhaps because we were young &had only each other the thought of following the pediatrician ‘s advice was beyond our grasp–put her in an institution & forget about her!! She has been my hero, andwe have enjoyed her part in our lives. lauren, love to read Sipping Lemonade! I grew up with one of my favorite people, your mom. I have a 52 yr. old daughter with Down syndrome and would love to share the joys , and tribulations, of having her in my life.She will never cease to amaze you. Slow!… I don’t think so! She’s always thinking. She loves music, dancing. Has numerous medals for Special Olympic swimming. Worked in the community, had her own apartment, traveled to Europe (with a group) and brought unconditional love to her family and all who met her. She has the same needs, desires and foibles as any other young lady. Sit back and enjoy the ride! God Bless. 🙂 I just read this for the second time. I had my son on June 25, 2013. A couple days later this story was published in the Chicago paper. A friend brought it to me, and it has hung on my fridge since. Thank you for helping me see the good that I needed to see. I’m a 20 year old new mom, I’m happy I found this letter. While in the delivery room marveling at my beautiful new baby girl the doctors told me that she had down syndrome, they sympathized me and told me that it would be hard to accept her “conditions” and saying goodbye to the child I dreamed of having through pregnancy.. Already in love with her I didn’t need sympathy because I knew she was a blessing. Every little kick and hiccup I felt as she got bigger in my belly let me know I was getting closer to meeting the little person I grew to love and no matter what I ‘ wasn’t’ prepared for I am prepared to love her for the rest of her life. My cousin has Down syndrome and this weekend we are celebrating her 40th birthday! When she was born the doctor advised that performing the heart surgery she needed would be a waste and they should “let her go.” I’m so glad they didn’t pay any attention to that ignorant man. She blesses the lives of everyone she touches. Thank you for sharing your story! Your Kate sounds like a beautiful person. Just wanted to let you know that I shared this post to a birth forum three years ago, and just came across it again, looking through my old posts. But this time, I’m 36 weeks pregnant with a little boy who most likely (91%) has Down’s Syndrome. Thanks again for your encouraging words. Looking forward to meeting our son, and discovering the gifts he’ll bring. What a beautiful piece. You’ve touched many – as is apparent in the comments. Thank you so much for sharing this heartfelt letter and your kind words of encouragement and inspiration. Yesterday I just found out that my daughter, and first born has been diagnosed with Down syndrome, and you’re right: my heart broke. I always have believed that everything happens for a reason that God chooses parents, so thank you for filling me with even more excitement about meeting my little girl. You and Kate have already touched my life and my loved ones lives by sharing your story. I hope that you are both doing well, and thank you again. Your words have impacted me in a way that words cannot express.